The Arc of Somerset County provides center-based adult programs at four facilities in Somerset County to over 200 individuals. Activities are designed to fit the cognitive and physical skill levels as well as the interests of the individuals enrolled in the various programs. 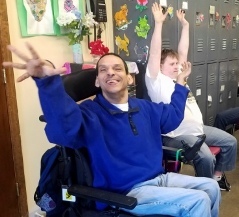 The focus of the programs is to foster positive work attitudes and behaviors while increasing social skill development for individuals who have little or no exposure to a work environment. In addition to assessment, counseling and training, fulfillment and production tasks are offered as a means of developing work skills and earning money. The Arc of Somerset provides business solutions to customers from a variety of industries such as manufacturing, pharmaceuticals, cosmetics, professional services and county organizations. Individuals receive payment for their work in accordance with Department of Labor, Wage and Hour standards. The Arc of Somerset County provides curriculum based programs that build the skills of the program participants and assist the agency in learning more about the interests of those served. A music program "Accessing Music Promoting Success" is offered at the program in Branchburg. Participants in this small group based program learn music concepts, develop the ability to create music in collaboration with other members of the group and learn music performance skills with the use of a group-participation system based on iPad technology and customized music applications. A Health and Wellness Program is offered at the program in Branchburg. Every morning participants complete an exercise program that consists of stretching, exercises, meditation, and chair yoga. During the afternoon. there are activities that promote exercise energy and attention, such as a dancing, game of Charades, etc. Regardless of their physical ability, everyone can participate. An Arts Program at one of the Hillsborough programs was designed to expose interested adults of all abilities to the process of art making in various forms. The program is committed to providing a safe and encouraging space to make art as well as converse and connect with new people outside of service relationships. 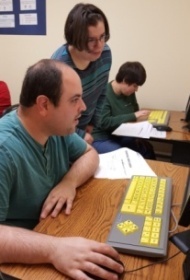 A Computer Class is offered at the program in Branchburg. This curriculum based program includes learning about computer basics, such as learning about the function keys on the keyboard and how to double-click a mouse. Participants then learn how to surf the internet utilizing Google and all its functions. These programs will eventually be integrated into the other employment sites at The Arc of Somerset County. Participation in community activities and job sampling are encouraged as possible. For some, community-based employment may become a goal. Hours of operation are generally 8:30A to 3:30P Monday through Friday with a 30 minute lunch time daily. Transportation is provided by Somerset County Division of Transportation. 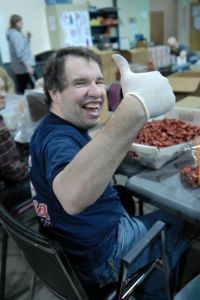 The Arc of Somerset works closely with the N.J. Division of Developmental Disabilities and the Division of Vocational Rehabilitation. For more information, please contact the Director of Employment Services at 908-707-1112 x22 or karenk@thearcofsomerset.org.